Reports have been flooding in detailing an update for Windows Phone 7.5, which can only mean one thing - Microsoft has begun rolling out Windows Phone 7.8 for those who own previous generation hardware. Windows Phone Central readers, as well as WP7.nl have received notification of an available release on the Lumia 800. Windows Phone 7.8 is a major update that Microsoft announced alongside Windows Phone 8. The release is to implement new features on legacy hardware, including the new start screen Live Tile layout and other goodies. Those who have managed to receive and apply the 7.8 update have noticed a new splash screen and Xbox Live Tile that are present on Windows Phone 8. 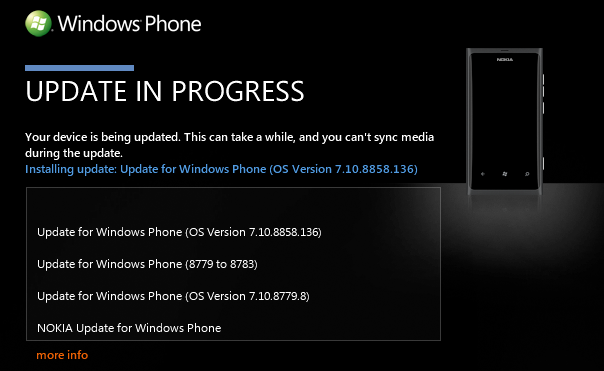 According to WP7.nl, the update process for the Lumia 800 includes a number of builds as well as a Nokia update. Reported OS version 7.10.8773 is bumped to 7.10.8779.8, and is then proceeded with the update to 7.10.8783. This then prepares the device for the final update to 7.10. 8858.136. Welcome to almost-Windows Phone 8. We're yet to get our Windows Phones to register the update, so be sure to let us know if you've received the one in the comments, along with which Windows Phone you're using and carrier (if applicable) you're with.